You may have seen the 2017 movie, Loving Vincent. Each of the 65 000 frames in the 100-minute long film is an individual oil painting on canvas. It mimics Van Gogh’s stippled style of art, exemplified by his famous painting, The Starry Night. He uses thousands of tiny brushstrokes that, seen as a whole, make it seem like the sky is moving. The perception of flux is generated by individual particles as perfectly aligned as an electromagnetic field. Its granularity gives it fluidity. Looking back in this election year, and depending on their party allegiance, politicians will paint a picture of progress or stagnation. They will use broad brushstrokes to highlight their own successes and most likely smear those of their opposition. They will promise grand schemes of social engineering, which will almost inevitably be less grand in implementation. A quarter of a century into democracy, we must ask why the sweeping political changes of the 1990s have not yet translated into the profound social change that South Africa needs. At issue here is not the speed of transfer of political power and privileges, but rather whether the nation’s people were able to adapt enough to benefit fully from the new political order. The word ‘evolution’ tends to be associated with a slow pace of change, but actually, it’s the most radical process in the world! It brings about profound and lasting progress for organisms that are able to adapt to changing circumstances. We humans are so focused on making meaning of our brief lives we tend to forget that – like every other organism – our species continues to evolve biologically. But we are also special in that we are evolving socially as well, in the way that we structure our societies and choose to think and act. With adaptation, we progress. Without it, we stagnate. We tend to think of human progress as occurring in wave surges – driven by technological breakthroughs or ideological movements – but often fail to understand the underlying incremental processes that give rise to that momentum. Science is propelled by the accumulation of a myriad molecules of knowledge, constantly pruned and reshaped like crystallising salt. Ideas and opinions gradually coalesce among individuals until they reach tipping points that sway the whole of society. Beneath the surface, long-term social change is far more fractal than wholesale, more granular than sweeping, propelled by the invisible hand of constant micro-adaptation at the individual level. And for any given circumstance, evolutionary dynamics always favour the most adaptive. At both an individual and societal level, people are most adaptive when they are capable of meeting their survival needs and of seizing the opportunities that allow them to thrive. We refer to these capabilities as human agency. So how do we change a society? Top-down campaigns aimed at normative change – changing the way people think, talk and act – can only go so far. One need think no further than the limited success of the Moral Regeneration Campaign, Drive Alive, and 16 Days of Activism for No Violence against Women and Children. Similarly, mass service delivery programmes have done little to temper community dissatisfaction or promote social cohesion. They may even have fostered a sense of entitlement and undermined community ownership. For these policies and programmes to have effect, people must be in a position to adapt their own behaviour – not because they are told to, but because they want to. There must be the motivation for change – and psychologically, that motivation flows from a sense of personal agency. Arguably, this is the main reason for sub-optimal progress in human development in South Africa over the past 25 years: human agency has not been placed at the centre of national transformation. Instead, there has been a preoccupation with the redistribution of financial and physical assets, too often in a zero-sum game. In the subtle processes of social transformation and justice, the hand of government has been clumsy and ineffective. Not that material redress is unimportant, but the most fundamental and enduring redress will be achieved through the equitable development of human agency. Such a strategy would be not only redistributive but multiplicative as well. In other words, the pie could be divided more fairly and grow bigger at the same time. 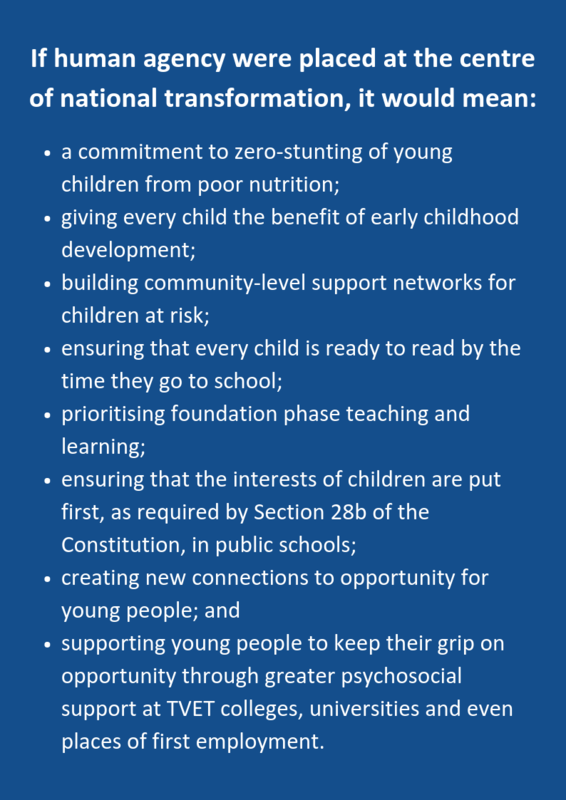 These are the key strategies for national transformation – and all of them need to be in place if every child born this year and beyond is to thrive. Of course, personal development should never stop, but it is fair to say that the State’s responsibility for developing human potential should be concentrated in the child and teenager. This will require a fundamental shift in political thinking, to make the development of the child the central National Project. If we did that, we would have a totally different picture of human development than we have in South Africa today. It would portray a flying nation – with far less crime, drug and alcohol abuse, and gender-based violence. It would be a picture of radical and dynamic social change. And if we looked at that picture up close, we would see that it was alive – comprised of millions of children and young people, each with the adaptive agency to seize on the growing number of opportunities that come their way. Dr David Harrison is the CEO of the DG Murray Trust. This article appears in our 2018 Annual Report and appeared in the Sunday Independent, Weekend Argus and Sunday Tribune on 07 April 2019. 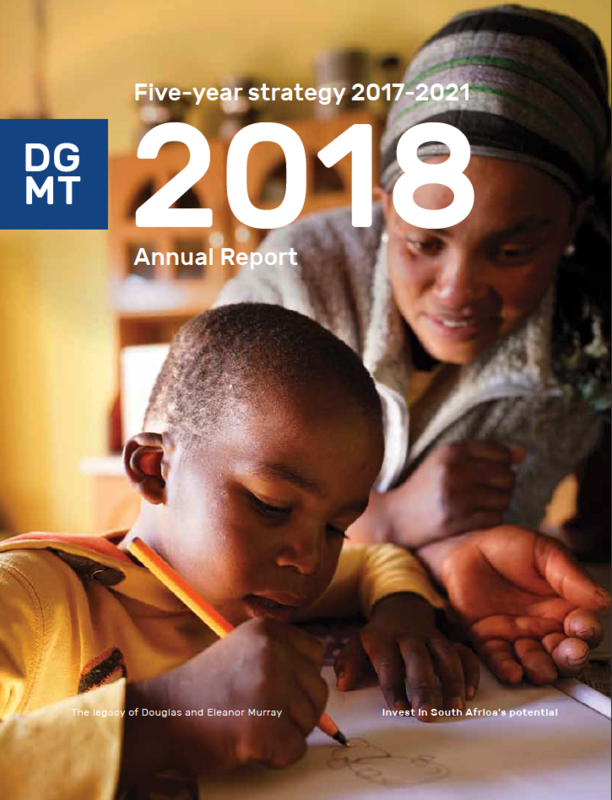 Read DGMT’s Annual Report for 2018 here.